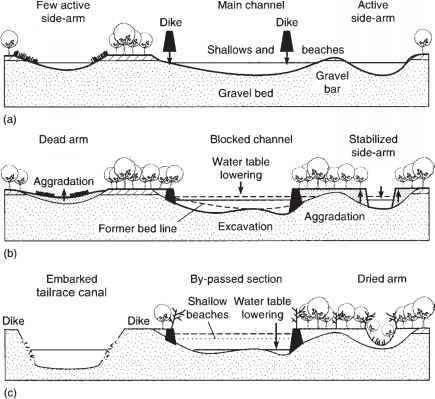 FIGURE 11.3 Nitrogen dynamics in a stream ecosystem. Bioavailable inorganic nitrogen consists mainly of nitrate and ammonia, which is immobilized by autotrophs and microbial heterotrophs in biofilms or in suspension, and by higher plants. Assimilatory uptake refers to nutrients that are incorporated into cellular constituents and are potentially available to higher trophic levels. Excretion, decomposition, and production of exudates are the principal pathways by which elements are recycled to an inorganic state. Various dissimilatory transformations of inorganic forms of nitrogen by bacteria add to the complexity of the nitrogen cycle. Cyanobacteria and other microorganisms capable of nitrogen fixation transform N2 gas into ammonia. Nitrification, which takes place under aerobic conditions, and denitrification, which takes place under anaerobic conditions, further influence the quantities and availability of dissolved inorganic nitrogen (DIN). the central role of bacteria in its transformation from one form to another. To understand the complexities of the N cycle, it helps to recognize that some transformations are to obtain N for structural synthesis (assimilatory uptake), while others are energy-yielding reactions (dissimi-latory uptake). Nitrogen fixation and assimilation of DIN by autotrophs and heterotrophs are in the former category, whereas nitrification and denitrification are reactions where bacteria obtain energy by using ammonia as a fuel or nitrate as an oxidizing agent. Primary producers rely primarily on the surrounding water to supply the nutrients needed for protein synthesis. Bacteria and fungi can meet much of their nutrient requirements from their C substrate, but when that substrate is poor in nutrients, these microorganisms also rely on nutrients in the water. Biological uptake and incorporation of nutrients into new tissue is referred to as immobilization, and may be by autotrophs or heterotrophs. Ammonium is taken up more readily than nitrate, which requires energy to convert into ammonium prior to assimilation. Since ammonium usually is a small fraction of DIN compared to nitrate, N fixation, in which bacteria and cyanobacteria convert N gas to NH^ and incorporate this ammonium into bacterial biomass, may be favored under N limitation. However, N-fixation by cya-nobacteria also is energetically costly, requires molybdenum, and is restricted primarily to taxa with specialized cells called heterocysts that protect enzymes from oxygen. Nitrification and denitrification are energy-yielding reactions carried out by specialized bacteria that do not assimilate the N but transform it between various inorganic oxidation states. Nitrification, the oxidation of ammonium to nitrate, can be an important source of nitrate to streamwater (Bernhardt et al. 2002). Its rate depends on the availability of ammonium and dissolved oxygen, and on the abundance of nitrifying bacteria (Kemp and Dodds 2002a, Bernot et al. 2006). Significant nitrate generation can occur within the hyporheic zone provided oxygen does not become limiting due to inadequate water exchange or very high bacterial respiration (Holmes et al. 1994, Edwardson et al. 2003). In denitrification, certain bacteria use nitrate as an electron acceptor to oxidize organic matter anaerobically in energy-yielding reactions analogous to aerobic respiration, and in the process reduce nitrate to nitrous oxide and nonreactive N2. 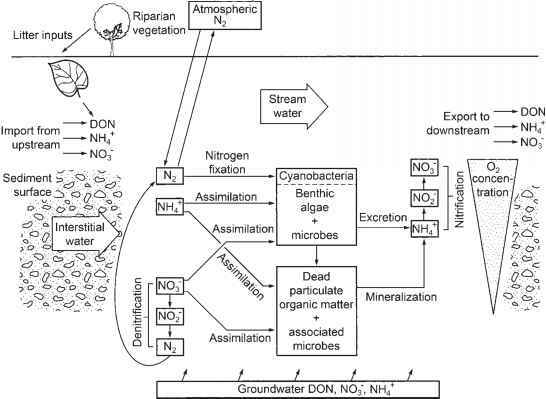 Because the end product is N2 gas, which is unavailable to most of the biota and can outgas back to the atmosphere, denitrification represents an important pathway by which excess N can be permanently removed from aquatic ecosystems.